If you are an expat, you must have likely experienced the expat syndrome called, loneliness a.k.a. homesickness. And yes, it doesn’t matter how long you have been an expat, one way or the other, you will go through this phase. Good news is you should not be hard on yourself when it happens because there is nothing strange nor insane about feeling nostalgic once in a while particularly to those based abroad, just like us. Do not feel guilty about it. Nearly all people miss something about home when they are away, making homesickness a universal experience. For someone like me who’s been an expat for more than 10 years, I have already identified some ‘healthy ways’ on dealing with it. Here are some of my ‘coping-up’ strategies. Do not be in denial – You cannot forecast the day you will be homesick. It is an emotion inevitable to those of us living thousands of miles away from our country, therefore we are entitled to sometimes long for the ‘warmth hug of home’. Cry if you need to, to give way to your humanity but don’t pity yourself. It’s not your fault to be the one nominated to work abroad, unless you personally volunteered. 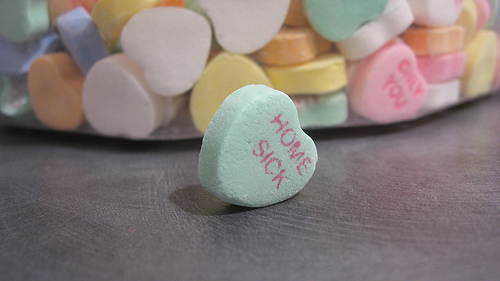 Remember, homesickness is a temporary phase and should eventually disappear. You can be slightly dramatic about it (if you were me), but try your very best not to prolong the process. It may lead to depression and we do not want that to happen, ever! 🙂 If your budget permits, treat yourself for a movie or go out on a dinner with a good friend. I’m sure that would atleast help uplift your spirit. Motivate yourself – The last time I felt the syndrome, I was caught off-guard. It invaded my peace. The one thing that I misses the most from home were those days well-spent with my mum. Her cooking, her laughter, and those many special reasons to missed her presence. She went home with the Lord in January 2012. Though I was so thankful that God allowed me to personally be there when she was hospitalized till the time we said our goodbyes, but I suddenly felt like I was cheated by time. I resigned from work and went back home six months before she passed away, without knowing we only had those six months. I was away for so long and six months for me was not enough to pay back our lost time. It just saddened me. Got me back on my feet by the thought that God at least gave me those last six-wonderful-months with her especially the time when she needed me the most; those thoughts comforted me. I terribly missed her but she was not ours to keep. Motivate yourself. There will always be something to thank God for. Pray – I’ll bet my life on this! Prayers work wonders! More than ever, this is the best time to be positive and remind yourself that the God of the universe loves you. Be of good courage. That regardless of the depth of the homesickness we experience, life must go on. The actuality of the matter still remains, that we made a decision to be where we chose to be, and we should be at peace with that choice. In case you are unhappy and sometimes feeling guilty for leaving your loved ones back home, be courageous and look at the bright side. That’s the reason why you are called the modern day hero because of your sacrifices. But yes, I admit that it occasionally crossed my mind that it doesn’t seem fair and just at times. So, pray for God’s direction and plans for you and your family. He knows better. Ending with a quote from a book by Joyce Meyer entitled, Battlefield of the Mind. She wrote – “You cannot have a positive life and a negative mind.. right thinking is vital to victorious living”.